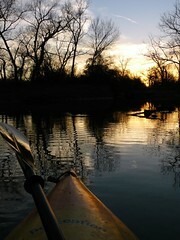 Yesterday afternoon's low wind and warm temps coaxed me and Dianne to launch a sunset paddling trip on Deep Fork River near the Nuyaka Creek Winery. I like paddling this part of Deep Fork because it is close to home, close to the winery and close to a classic old antique metal bridge that makes for nice photos. If you ever happen to be making the trip to visit my parent's winery, you may want to consider taking a kayak with you. The River bridge, just a mile or so down the road from the winery, offers some interesting water for kayaking either upstream or downstream. From the main river bridge, you can paddle up stream for a couple miles until you reach a low water bridge and then turn around and head back or portage around the bridge. The biggest drop that I am aware of on this part of Deep Fork is right at the main bridge where you put-in. If you are paddling downstream from the bridge I DO NOT reccomend running the small rapids at the put-in. The rapid used to be another low water bridge so it is loaded with old chunks of cement and rusty sheet metal. However, just under the Deep Fork River Bridge is a large rocky area that makes it easy to put-in the river and go up or downstream while avoiding the rusty rapid. Dress for mud, extreme mud! The Deep Fork River is full of, covered with and surrounded by sticky, slippery, red clay mud. Watch your step because the stuff is very slippery and tends to stain clothing. You may want to bring extra shoes. Deep Fork River fishing is usually quite good because it is loaded with catfish. However, you may have some trouble keeping your fish. Both turtles and aligator gar are also present, so fish trapped on a stringer are likely to not make it to the take-out. We always considered a wire fish basket to be vital for bringing home dinner from old muddy Deep Fork. Have you heard about Kindle, Amazon's new replacement for books?